Back in February I wrote about the episode of Jeff Stormer’s podcast Party of One where I played the RPG Atomic Highway. My character in that game was a descendant of Frankenstein rebuilt to resemble the famous monster. That episode was actually the second that Jeff and I recorded but the first one is lost to the ether. I think it was something on my end but Jeff is way too polite to say so. With two games under my belt I think about the character a lot. Randomly one day I was thinking about how Lego had made a greaser style hair piece and how I had a few Frankenstein’s monster head pieces. The idea clicked into place like two Lego. The moment I could dive into my parts bins I quickly threw together Vic. I was super happy with the results but I immediately knew I wanted more. Vic was nothing without his car Elsa (named after Bride of Frankenstein actress Elsa Lanchester). 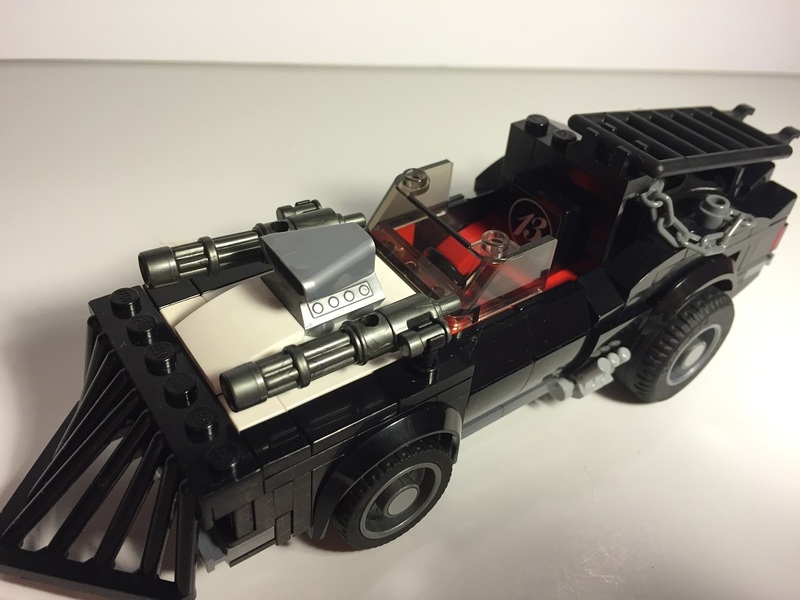 I knew I had to build the car too. Luckily for me I didn’t have to work completely from scratch. 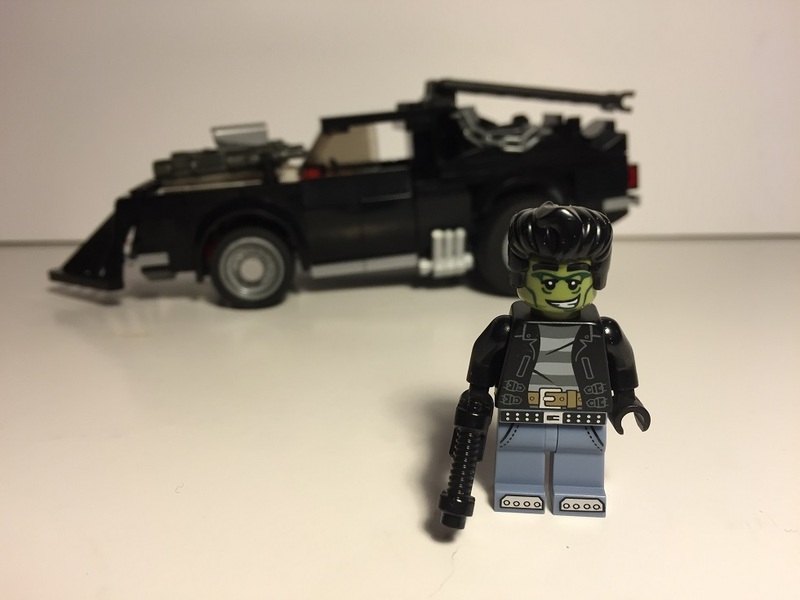 Lego’s Speed Champion line currently has a Camaro two pack. Once of those cars is based on the current model while the other is an older version that looked ready to drag race. It was a perfect base. There were things that needed to be on Elsa through; specifically a ram prow and two linked machine guns. 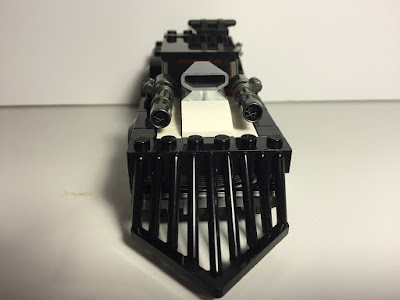 The ram prow was easy enough, Lego has made enough old style trains that getting a cow catcher just meat spending a few minutes on Bricklink. The machine guns were a little different; Lego doesn’t care for realistic looking weapons. After looking around for a little bit I decided to go the third party route. I placed an order for the Brick Arms machine guns and clips that allow them plug into jumper plates. The ram prow and guns required me to rework the front and hood of the car. I lost a lot of the sleekness that’s in the original set but it looks far more dangerous. Because of all extra hardware on the hood I raised the passenger area and roof up by one stud. 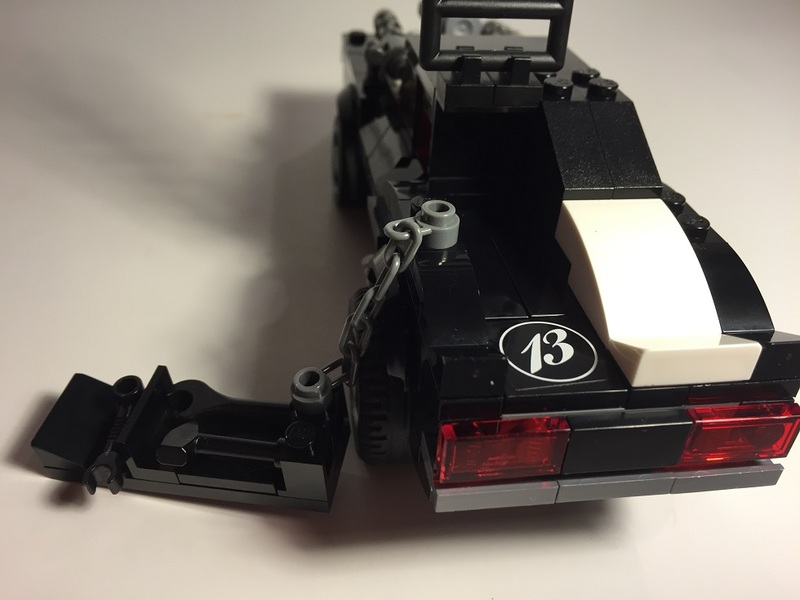 I also replaced headrest with a stickered tile that has a 13 on it. Vic always had a rockabilly vibe to him, so when I found the 13 stickers I knew I had to use them. I originally wanted the back end to be fully of survival type gear. I really, really wanted propane tanks and things like that. The scale eventually got the better of me. 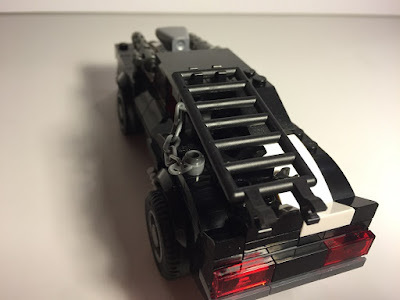 Had I made the car 8 studs wide instead of 6 I think my original vision would have worked but by this point I was already fully committed to the smaller vehicle. 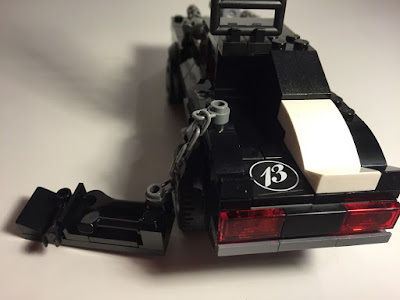 I also wanted to only use half the back end. That way I could still have part of the white stripe that goes down Elsa’s hood. This literally was the longest part of the build. 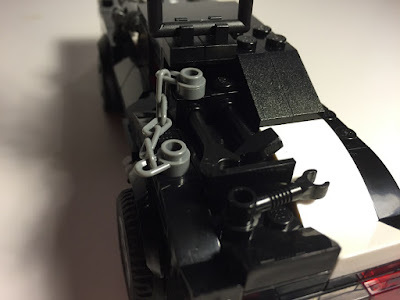 I took apart and rebuilt the back end numerous times until I got to a version I was happy with. The tool sled slides into place and is held in the back with the ladder and a chain. It rests on smooth tiles so it’s easy to pull out for use. Under the sled I used another of the 13 stickers. With the scale I was only able to get a hammer, wrench, and socket into the tool area but I feel it gets the point across. In the end I’m really happy with the results. Both Vic and Else turned out extremely close to how I imagined them. If you want to hear more about the character check out the Party of One Podcast. Make sure you give a listen to more than just the Apocalypse Highway episode though, there are far funnier people playing there that me.